Wrapping gowns were a form of daytime clothing worn by babies and young children between about 1700 and 1800. They were loose fitting, but often worn with a sash around the waist. 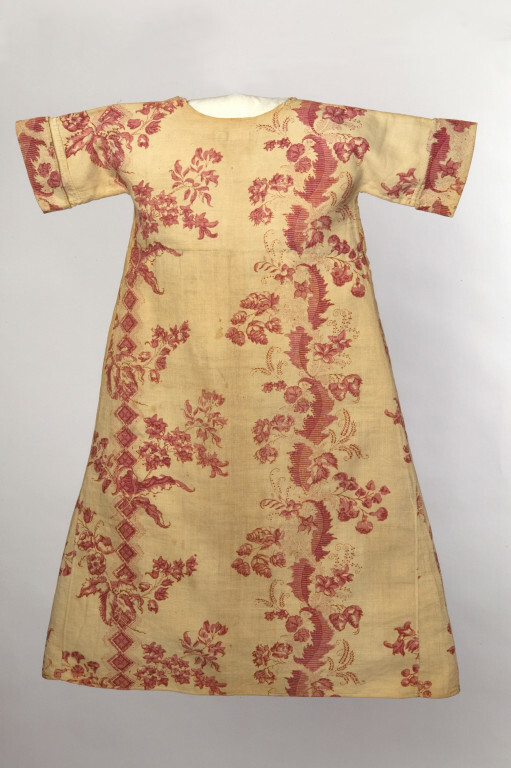 While a wrapping gown for an adult seems to have been some sort of nightgown, the adoption of wrapping gowns and other similar garments for children as daywear was probably influenced by Asian clothing given to the families of those who had trade links with the region. Lord Shelburne's two year old son Lord Fitmaurice had a 'jummer' (jama) of flowered gauze over blue silk in 1768. 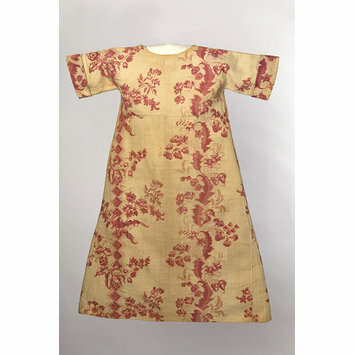 Child's wrapping gown of cream coloured cotton printed in red with flowers, foliage and lozenges. The gown has a rounded neck and straight sleeves which end in self fabric cuffs; it opens the full length of the front and has no fastenings. Said to have been worn by Benjamin Wetherell of Morley, near Leeds, born in 1716.